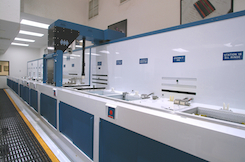 The CHEMEON Technology Center is designed and built to provide a state-of-the-art research center for the metal finishing industry and to educate professionals in the latest finishing techniques, as well as in CHEMEON technology. 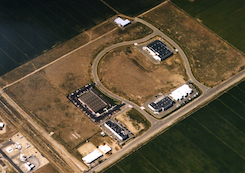 CHEMEON Tech Center brings together design, automation, computer science, and research and development excellence. It occupies 3,000 square feet designated for the research-scale finishing line, the process control center, the training classroom, the chemistry (analytical) area, and various safety features. The laboratory is illuminated with a combination of natural light, daylight fluorescent bulbs, and low-pressure mercury halogen floodlights. Visitors to the facility may look into the laboratory through windows in the western wall, classroom (southern wall), and second floor overlook (southern wall). Several pairs of rinse tanks are counter-flowed to reduce water consumption. 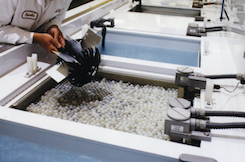 Each of the finishing tanks is connected to CHEMEON Process Control Computers to automate and provide reproducibility to the finishing process. 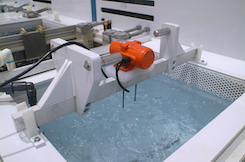 The process controllers are interfaced to the hoist control computer so that parts loads may be automatically cleaned, anodized, and provided with any necessary post-treatment. 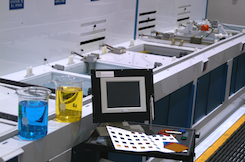 Work performed at the CHEMEON Tech Center can be designed for scale-up in the production environment to virtually any size line. In order to educate metal finishers in the proper techniques of finishing, a state of the art classroom adjoins the laboratory. Two large windows allow students in the classroom to observe activities in the laboratory. In addition, audio/visual communications connect the classroom to the laboratory. The chemistry area is designed to accommodate the day-to-day analysis of the finishing line. The laboratory has 300 square feet of bench top surfaces with stainless steel cabinetry underneath to provide adequate work and storage space. 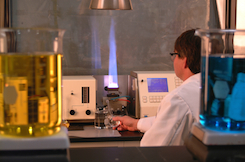 A bench is dedicated to the two spectrophotometers in the lab (atomic absorption and UV-VIS) and supplied with acetylene, nitrous oxide, dry air, and exhaust. 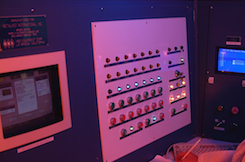 The instrumentation room is included in the laboratory for the use and storage of sensitive equipment. The instrumentation room houses the analytical balance, stereomicroscope, electronic test equipment, a computer workstation, and customer samples in progress. The instrumentation room has independent temperature control so that sensitive equipment may be maintained at a constant temperature. Daylight fluorescent lighting provides accurate color work and reduces eye fatigue. Ample counter space and cabinetry are also provided. 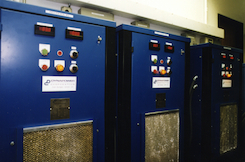 An adjacent equipment room contains support equipment for the laboratory and finishing line including a 20 gph reverse osmosis unit, 98 cfm air compressor, 6 ton chiller, and a salt spray corrosion chamber. Containment Basins - finishing line includes an integral containment basin to hold any tank contents in the event of a catastrophic tank failure. The walkway around the line is a raised grated basin to allow personnel to work safely and comfortably on a dry floor in an inherently wet environment. Waste Disposal - waste drains on the finishing line are segregated so that acids and bases can be safely and easily drummed for off site disposal. Used rinse water may be sampled and monitored from an access port outside the building. No chemicals except rinse water are disposed of on site and all liquid waste is drained and shipped for disposal. Air Make-up System - line incorporates a push-pull system to remove noxious fumes from the laboratory. A blanket of air is blown across the tanks and captured in a high capacity exhaust system. The air removed by the exhaust system is replenished by a 16,000 cfm heating/cooling unit on the roof. 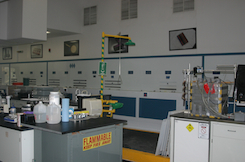 A large fume hood is located in the laboratory for working with dangerous or otherwise objectionable chemicals. Chemical Storage - cabinetry is available in the laboratory for segregated storage of flammable chemicals, acids, and bases. A large chemical storage area is also located over a sealed catch basin behind the finishing line. Entrances and Exits - laboratory contains the standard complement of safety equipment including safety showers, eye washes, first aid kits, and fire extinguishers. Appropriate personal protection devices such as protective eyewear, earplugs, and dust masks are located strategically around the lab area. Material Safety Data Sheets - duplicate Material Safety Data Sheet (MSDS) files are kept in the two separate locations: in the laboratory and in the receiving area of the warehouse. No chemicals are allowed beyond the receiving area without an MSDS on file. Chemical inventory is maintained on-line and is accessible from any computer station in the building.